No marketer worth his or her salt would ever copy a marketing plan from one company and hope that it worked for their own. Equally we’d be fools to not look at a marketing plan sample or three before beginning. Assemble a library of marketing plan samples that you like for whatever reason. Build a sales and marketing plan, not separate plans. 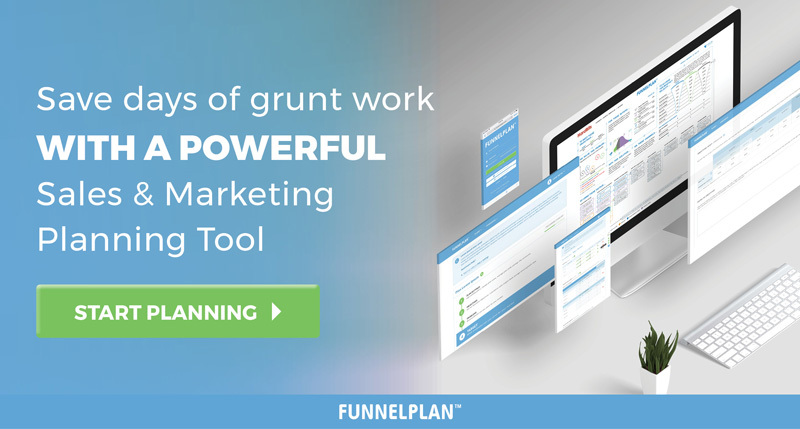 Use our marketing plan sample at FunnelPlan.com as the basis of your next plan. Let me show you a few marketing plan samples I found researching today’s article, and then how to get yours from ours for free. The first one we came across was an article I’ve used quite a few times recently from Dave Lavinsky. If you’ve not heard me rabbit on about this before, it’s a really good article and I recommend that you take a read of it. Links will be in the show notes. He explains clearly what you need in each of the sections. This is not a marketing plan sample and doesn’t set out to be. He showing you what to include and frankly does a perfect job of that. A good place to start so take a look, it’s worthwhile. The next one is a marketing plan sample from MoreBusiness.com. Thanks guys for putting this out. It explains in a great level of detail what the plan for this company is, and includes sense and the vision, the objectives that they have for the company, the target markets, their general segmentation strategy, who the competition is, a communications plan, and expense budget. The progress and reporting, let’s get down to that, these are all outcomes, not inputs. If you’ve followed the show for a while you know that I’m a big fan of looking at multiple interim inputs. You measure by the inputs not the outputs. But frankly in a consumer oriented business this is probably good enough. I think it’s a great sample marketing plan, and it doesn’t set out to be a B2B one. Obviously in B2B the buying process is far more complex, you need to spread out the tactics necessary for that. It didn’t set out to, it’s a good job, great contribution and I do recommend a look at it. Next we go to examples of how to write a marketing plan by Chronical. It’s awful. They clearly haven’t written it with any real market focus in mind. There’s silly formatting errors that suggest they didn’t even go back and look at it once they loaded it up. Next one, not relevant for our audience. Very, very simple. It’s written for sports clubs, and it kind of does what it sets out to do so I won’t can it. For a B2B listener, I think it’s not so relevant. Again, kind of don’t bother. Last one, BusinessBulls.com. Now, this is a really good contribution. Firstly guys, thank you for it. I would suggest that it’s a really good introduction to planning. Unfortunately it’s not a sample. It’s an explanation, and there’s a couple points that I quite like, if you read deep into the details. I’ll give you the punch line though, this isn’t the one I’m going to recommend you read. The Forbes article is definitely the one to take a look at, and the sample plan from More Business. In any case, I particularly like their comment here about keeping it really simple and actionable. Again a good contribution. Frankly if the Forbes article wasn’t there this is one probably would have got up. Even though MoreBusiness.com gave us a great marketing plan and sample, when I distil the headings it didn’t come down to much. I’m going to go again with Dave Lavinsky’s article. I’ve used it a number of times, probably because it’s good, on Forbes.com. Let me share with you the essential ingredients that he suggests need to be in the marketing plan, and that you should be looking for in a sample. What your unique selling proposition is – price, positioning strategy and distribution plan. As I’ve argued previously, there’s no point in writing a long marketing plan and then synthesizing it, because no one’s going to read the long one. Keep it short. My recommendations again: A similar library, make those sales and marketing plans as best you can, keep them short and use Funnel Plan, that is our FunnelPlan.com to be the basis of your next marketing plan. If you’ve read the Leaky Funnel then you would know already about Hybrids, the fictitious company that I used to explain the process of building a sales and marketing plan with the team. If you haven’t read the Leaky Funnel, don’t worry too much, it’s just a fictitious company. I’ve actually got their sales and marketing plan that I can show you. I want to show it to you in a context of Funnel Plan the software, because what I’m going to invite you to do for free is to access that same plan as the basis of a plan for yourself. In today’s demonstration I’m not going to show you the advanced functionality of Funnel Plan. Save that for another day. The paid for version goes a bit deeper, but frankly as I’m going to suggest at the end, the free version is probably enough to get you going. What are your objectives? What problems are you in the business of trying to solve? It’ll ask you to do some analysis of those problems and choose one. Then the target market – and that’s particularly who has the problem. What does their general profile look like? What does it take to fully solve that problem? Again that’s your solution strategy. In this case we want to know what it takes to fully solve the problem. What channel will you use to reach that market? – And by this, we mean sales channel. Who else can solve the problem and how do you stack up against them? What velocity do you need to reach? Again in the free version you’ll be asked some fairly innocent questions. How long does it take to win a deal? How many meetings does it take? In between what percent of your leads will become proposals and what percent of your proposals will become sales. Four very basic questions that we break down into far more advanced information. All you need to answer are those simple questions. Then that tactics you’re going to use. In the free version you’re using templated tactics. Again for now that will be enough in the Hard Bits plan. Let’s take a look at the pdf that comes out of that. All of that information distilled into a one page plan you can stick up on the wall, share with sales and marketing and be mutually held accountable to. I didn’t want today to be a pitch about Funnel Plan, but obviously it’s a great way to build your sales and marketing plan and you can do enough of it for free. That’s why I showed it to you today. Our call to action this week is simple – and kind of obvious. Head on over to www.funnelplan.com. Head over there and what you’ll be able to access is Funnel Plan the software. You can get a free plan and you can use the Hard Bits plan as the basis of your plan if that’s what you’d like to do. There are other templates that you can use as well. If you head on over there you’ll be able to build your plan for free using one of the pre-built templates. You can always upgrade to a paid version later. It gives you a lot more functionality, a lot more granularity, but frankly the free one’s enough to get you going for now. 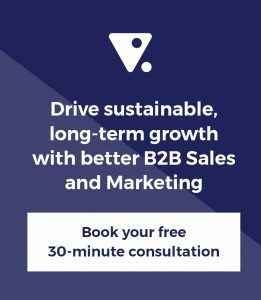 A basket full of nurtures – our favourite tactics for recycling [VIDE... How to grow your business as high as a ‘magic beanstalk’.